Ever hear someone say something like, “Hey, wow, great news everybody! Racism’s over! We fixed it!” … Yeah, it seems there’s still a little something called systemic racism—and it’s real. While fewer people may consider themselves racist, racism itself persists in our schools, offices, court system, police departments, and elsewhere. Think about it: when white people occupy most positions of decision-making power, people of color have a difficult time getting a fair shake, let alone getting ahead. Bottom line: we have a lot of work to do. Here are seven ways we know that systemic racism exists. According to one study, white families hold 90% of the national wealth, Latino families hold 2.3%, and black families hold 2.6%. Not only that, the Great Recession hit minority families particularly hard, and the wealth gap has increased. Think about this: while median wealth for a single white woman in the US is $41,000, the median wealth for a black woman is $100. And for single Latinas it’s $120. That’s almost unbelievable—and it’s a huge racial-justice issue. Perhaps black and Latina women are being financially exploited by purveyors of delicious but expensive and fattening ice cream? Perhaps they should cut back on expenditures on unhealthy luxuries? Ben & Jerry’s (a Unilever brand since 2000) founders Ben Cohen and Jerry Greenfield were both born in increasingly diverse Brooklyn in 1951. Their parents soon moved to Merrick, NY on Long Island (Merrick was 95% white in the 2000 Census), where they met in 7th grade gym class and found they had much in common. They chose to move in 1978 to Burlington, Vermont, 45 miles south of the Canadian border. Why? For roughly the same reason Brooklyn-born Bernie Sanders had moved to Burlington a decade before: Vermont’s Diversity! In the 1980 Census, Vermont was 0.2% black and 0.6% Latina. Obviously, it’s just social conditioning that Ben & Jerry’s sells, for example, Chocolate Peanut Buttery Swirl ice cream. Human beings could be socially conditioned to like any two flavors together as much as they tend to like Peanut Butter & Chocolate. Granted, you feel Implicit Bias against most of these flavor combinations. But that’s just society’s prejudice against Orange Juice & Toothpaste talking. 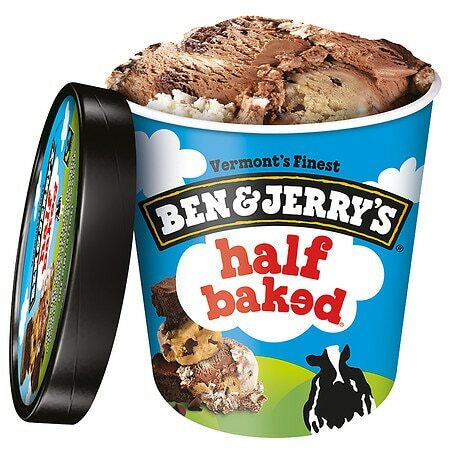 Ben & Jerry’s are betting the company that with enough advertising we can make you love these flavor combinations.